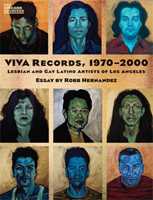 VIVA, a non-profit artists’ coalition founded in 1987, promoted the creative and artistic talent of gay and lesbian Latinos and Latinas in Los Angeles. It worked closely with other gay and lesbian organizations, using arts-based projects to address cultural and sociopolitical issues that were of concern to its community. Its exhibitions, theatrical productions, writers’ workshops, and educational outreach programs brought national as well as area recognition to VIVA and its members. Robb Hernandez draws on the VIVA Records, an archival collection at the UCLA Chicano Studies Research Center, to trace the organization’s history and assess its impact. The first organization of its kind in Los Angeles, VIVA offered a stage and a voice for artists who had been routinely marginalized. A guide to the collection and a selected bibliography round out the volume.